Seems like you can't walk in to any electronics store or big box store without seeing a wall of portable speakers. You know that wall with a big red button under each speaker that turns it on and plays some 8-second clip of a top 40 song. There are dozens of in-store options and hundreds more if you scour the Internet. Though very few of these portable speakers stand apart from the crowd. 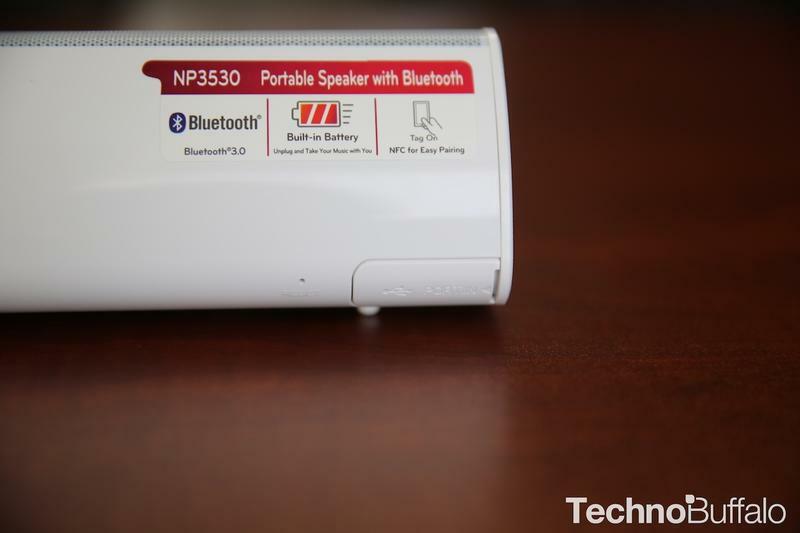 The LG Portable Speaker (LG-NP350) however is one of the few that stand apart from the crowded speaker market. First of the speaker looks great and seems to be made of higher grade materials than its competitors. Hopefully you aren't throwing the speaker around and bashing it on hard surfaces, but it looks durable enough for a tumble on your kitchen floor or elsewhere (I generally don't recommend throwing any gadgets around). 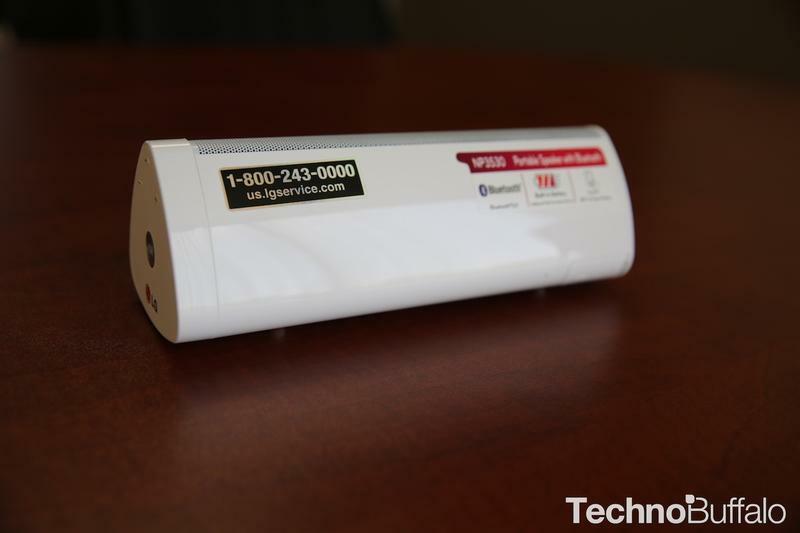 Portable speakers are great for barbecues, hanging outside with friends, or in your own home or office. But rarely do they offer audio quality you could be proud of. Not all speakers are same and most of the options on the market do a good job of making things louder, but it doesn't actually do the audio quality any justice. However this speaker does exactly that and boasts some awesome features and specs. You probably won't be using these speakers to play Avengers from your home theater, but that is not what these speakers are intended for. Bluetooth speakers have a place in the market that I feel most people take for granted and instead force loud sounds (albeit not great sounding) through a smartphone/tablet's subpar speakers. 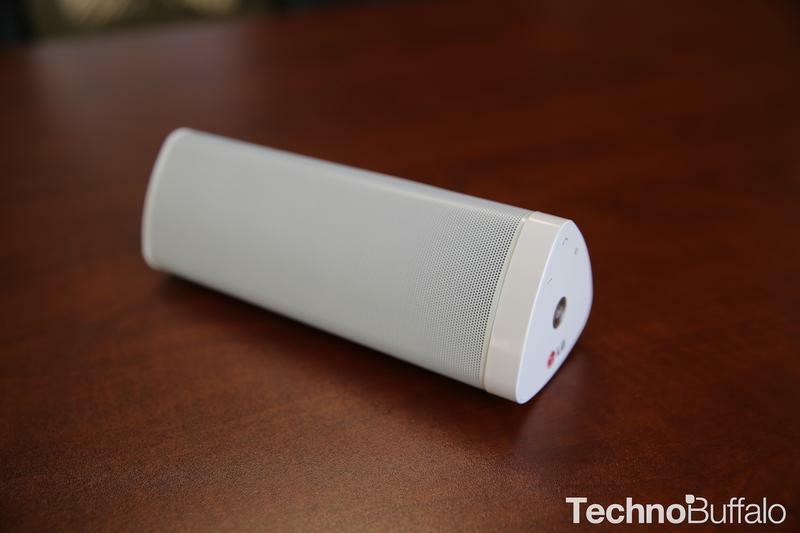 As with most portable speakers on the market, the LG speaker has Bluetooth connectivity so you can easily stream from your mobile device or computer. We paired our devices with the speaker and it was very easy to do. The music sounded decent and we couldn't detect any really noticeable loss in quality. The sound quality was somewhat better when we plugged in using the auxiliary cable as expected. 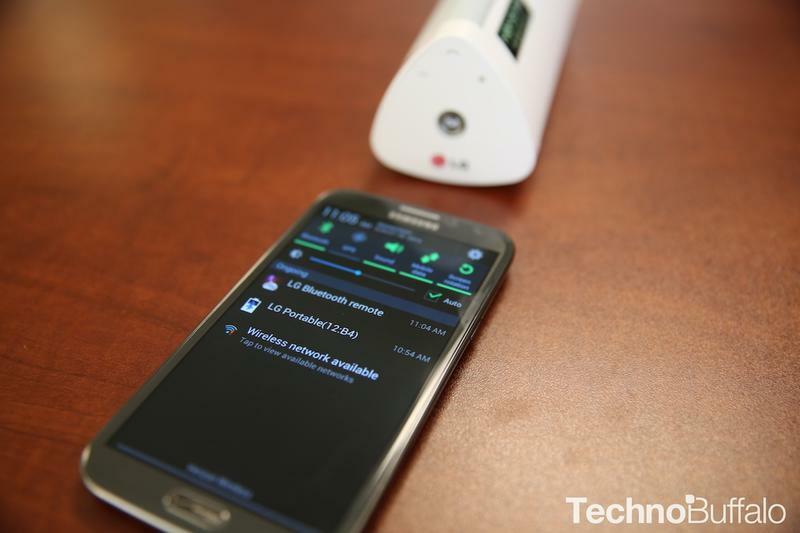 These speakers can also be perfect to use as an augmented speakerphone. The side controls include one for answering and hanging up phone calls. Of course the volume controls on the side work for phone calls as well. 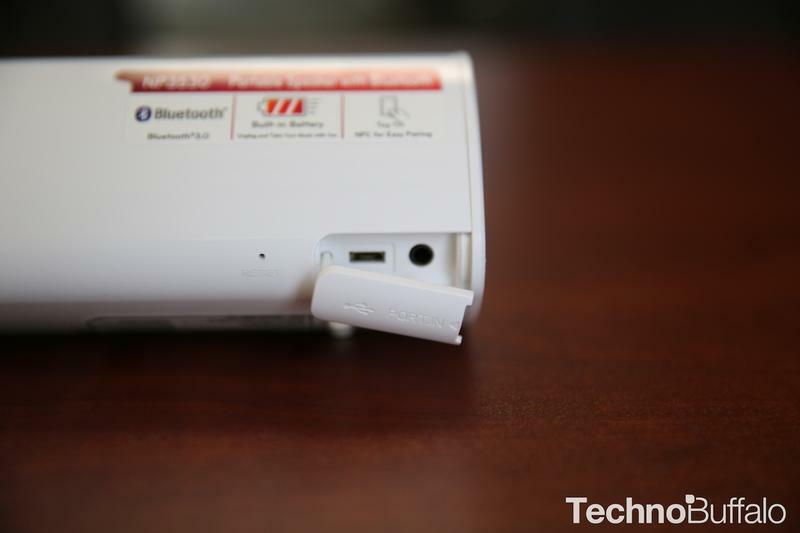 A lot of consumers miss the mark on just how useful Bluetooth speakers are. Not only are they great portable devices, they are perfect for the workspace and not only pair to a smartphone but also to your laptop or desktop (via aux cable or Bluetooth). 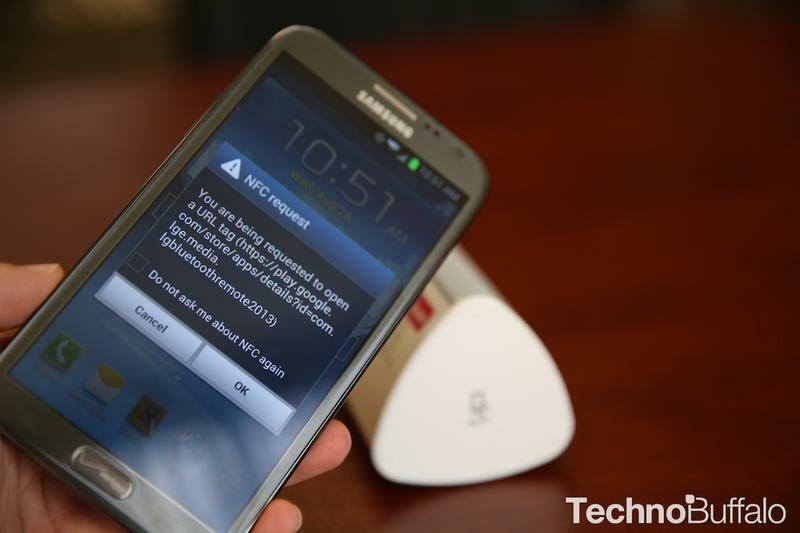 One added feature was the inclusion of NFC enabled pairing. 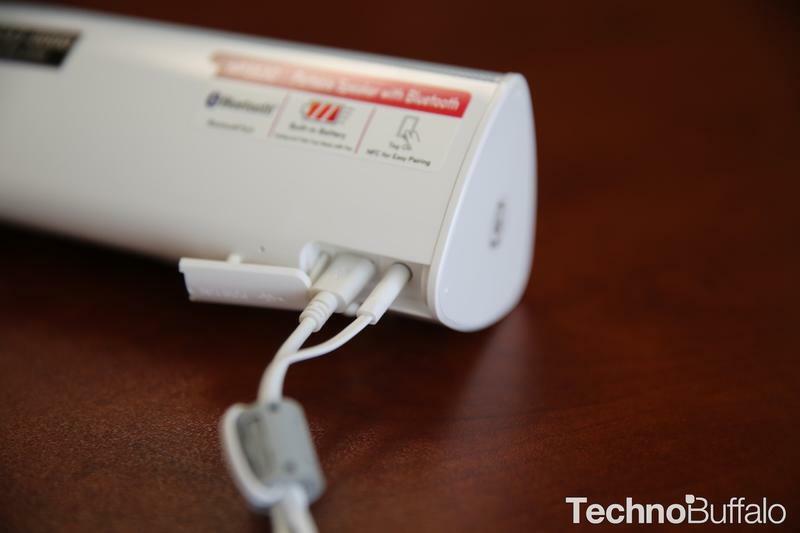 Simply by tapping the side of the speaker you can pair your smartphone or tablet (if they are so capable). 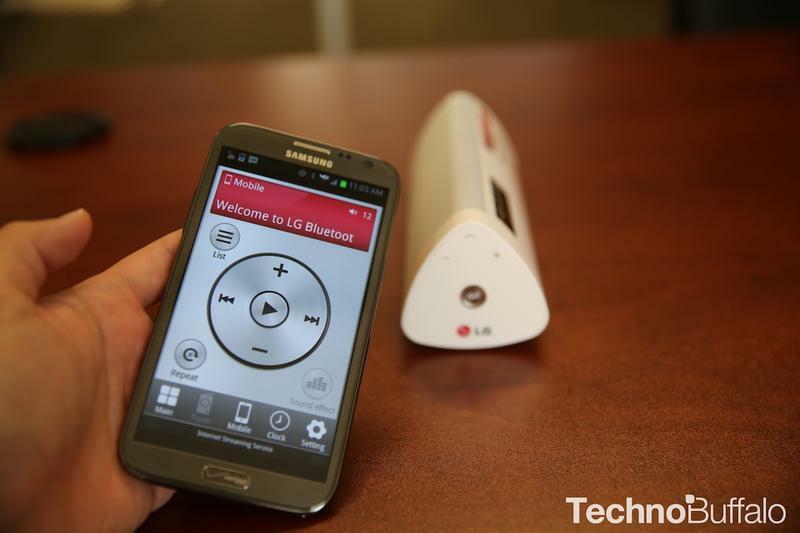 LG also has an app that allows you to control the speaker as you see fit (e.g., volume control, playlist, sound effects, alarm. 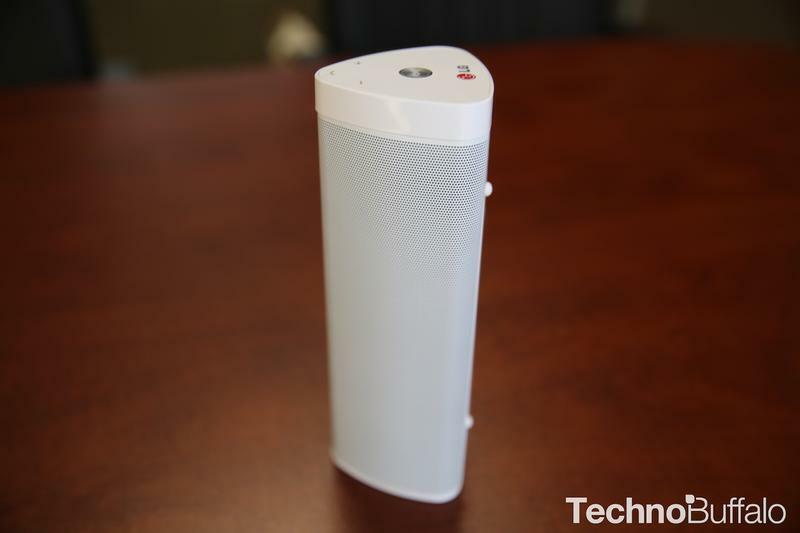 The app clearly adds convenience and flexibility over other portable speakers available on the market. 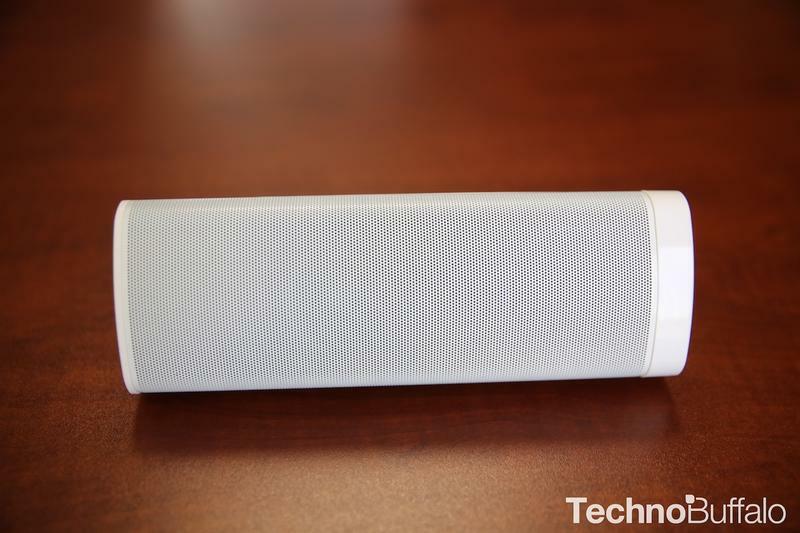 The LG Portable speaker boasts 10 hours of playback time and it does not disappoint. 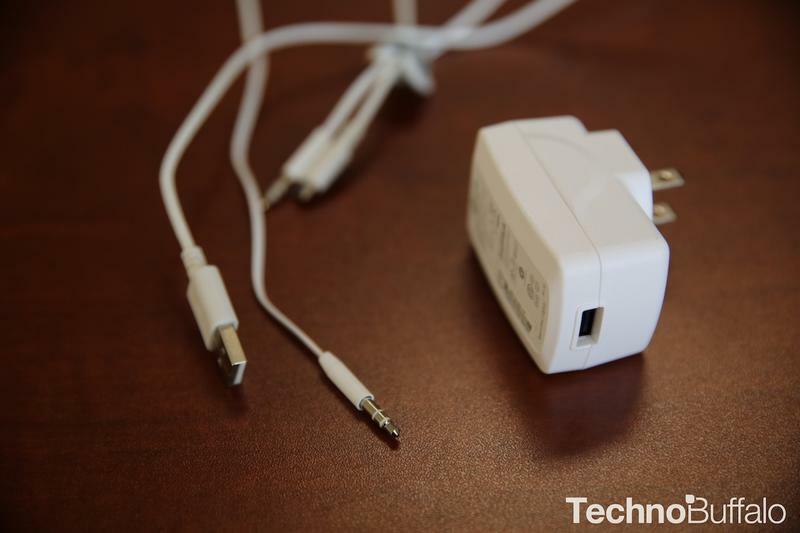 We got just around there in our tests and will say it is impressive considering the size and overall audio quality. Other units that I have tried out usually last around 6-8 hours of usage. I was very pleased with the battery results. 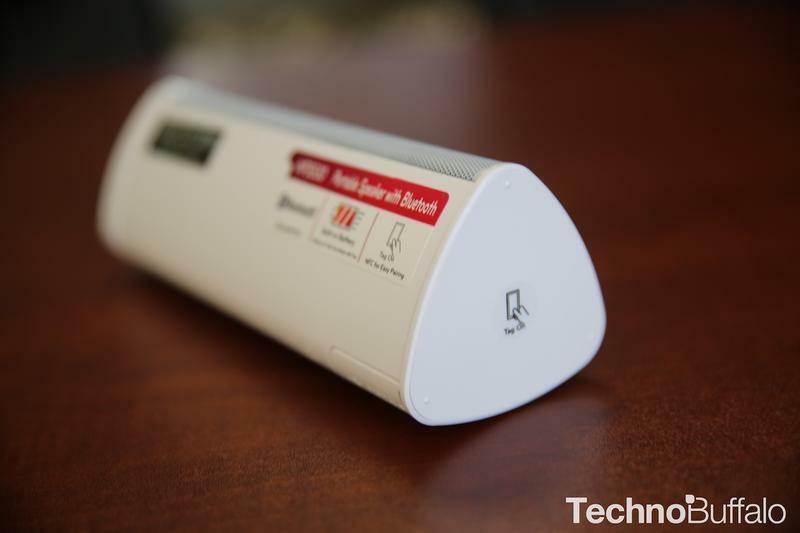 The LG Portable Speaker is a great portable speaker you will find is easy to use. The LG Portable speaker is a fine portable speaker with a number of great features, great battery life, a useful easy to use app, and great sound quality for its size. While the price point is a bit higher on the spectrum, it is about right considering the quality and available features. 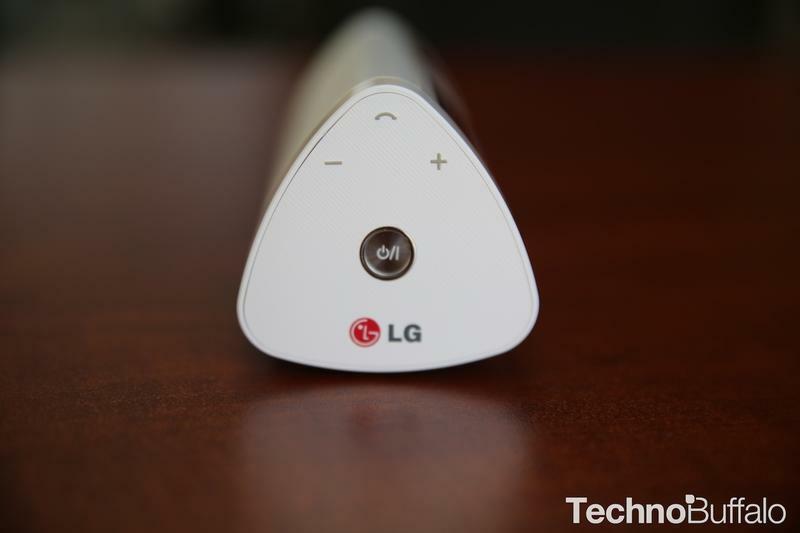 If you are looking for a better than average speaker you should definitely give the LG Portable Speaker a try. 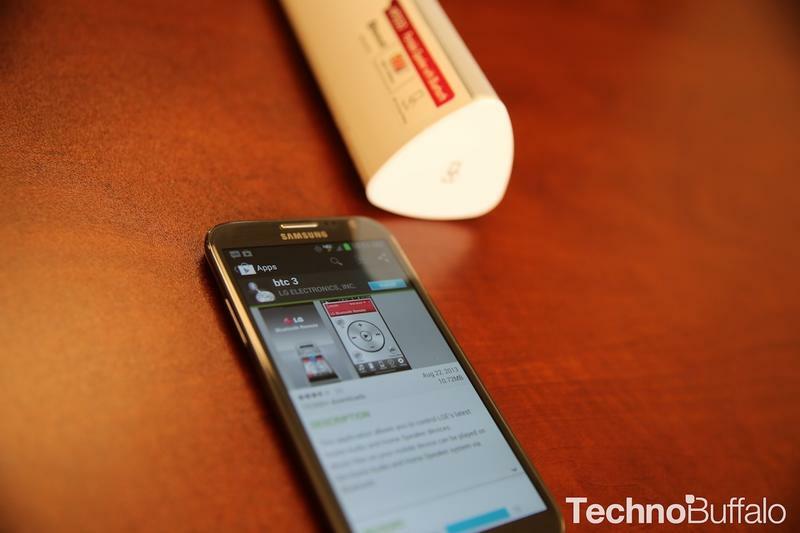 LG lent us this device for us to use for the purpose of this review.